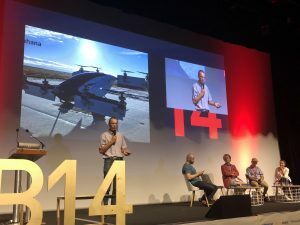 MOBILITY Day at Fab14 aimed to explore and predict new ways in which people, data, objects, ideas and more, move around the world – how we can improve them, what is being done on this subject and what the challenges are that we will face. Working for Airbus for 20 years, on the A380 Program and in the System Design Office, I have now joined the Chief Technology Officer group of Airbus to repatriate new technologies and propose disruptive concepts through agile method and fast prototyping. In that frame, I am leading a network of 10 ProtoSpace toward Airbus group, which is an internal Fablab network allowing Airbus designers to turn their ideas into reality. 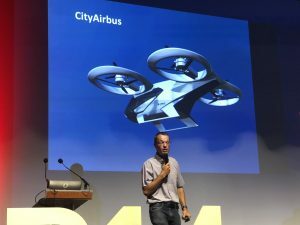 One other Innovation to address city mobility presented by Airbus: CityAirbus. Pop up Innovation was displayed in the Geneva air show. The body could be manufactured by a car builder or other builder and the aeronautics section would be manufactured by Airbus. World bank cannot fund roads in Africa especially looking at Lake Victoria area where over 40 million people live without infrastructure. They are working on drone ports. 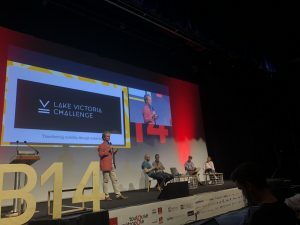 Simon Johnson mentors and invests in Swiss tech start-ups and is an advisor to the Swiss National Centre for Robotics. After a BSc in Computer Science and Electronic Engineering from University College London, Simon started his career with Hewlett-Packard, earning his sales and marketing experience as a manager for Africa and the Middle East. A serial entrepreneur, Simon left HP to create a satellite positioning, navigation and tracking systems company. He then co-founded and was CEO of a Softbank funded company, which provided the first premium content on mobile phones for companies including Yahoo! and Microsoft. 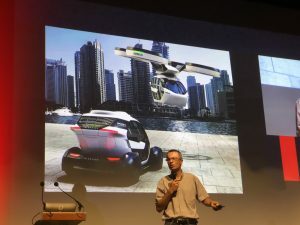 Simon produced and presented a primetime Swiss television program showcasing technologies that will change our daily lives. His latest venture is about stratospheric solar powered unmanned vehicles that will end the dominance of satellites! Simon is currently advising the World Bank on its future mobility project Lake Victoria Challenge.